Stained Glass Windows: The blue color of the stained glass windows of our church is the most fitting color to represent the blue sky and blue waters of our island. Our windows showcase both biblical and marine themes. For example, the figure of the pelican not only depicts our island sea birds but it is special as a symbol of the Eucharist in early ecclesiastical artwork. We encourage everyone to take the time to closely view and admire our beautiful stained glass windows. 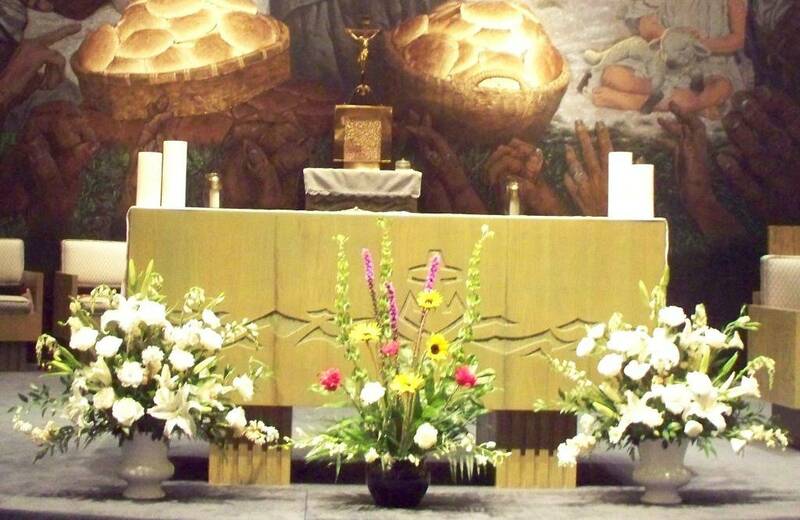 The Altar: Notice the common symbol of the sea, the anchor, that embellishes our altar. At second glance, it looks like a cross. This is an appropriate symbol of Christ as our true anchor and safe harbor. IRON WORK: St. Mary, Star of the Sea, Church is decorated throughout with exquisite wrought iron items that were designed and created by a former parishioner, Mr. George Kreissle. Former owner of the historic Kreissle Forge in Sarasota, Mr. Kressle worked with Fr. Pick to design such items as the church chandelier in the narthex, the iron gates leading into the nave of the church, the stations of the cross, and the holy water fonts, for example. Please stop to take a close-up look at this beautiful and special craftsmanship which helps to make our church the magnificent place it is. OUR MURAL: Each person who enters our church is immediately drawn to the beautiful and impressive painting behind the altar. Painted by a local artist from Sarasota, Mr. Frank Hopper, this mural exquisitely depicts the miracle of the loaves and fishes. Within the mural we see the status-conscious Nicodemus, the avaricious Zaccheus, the sensual Magdalene, the impetuous Peter, together with the blind, the crippled, the cynical, the young, the old, the devout. We can all draw upon the image of Christ in our mural. The painting is a beautiful illustration of the central truth of the Catholic religion - the Eucharist. Catholics believe that Christ is present at Mass in the form of bread and wine. 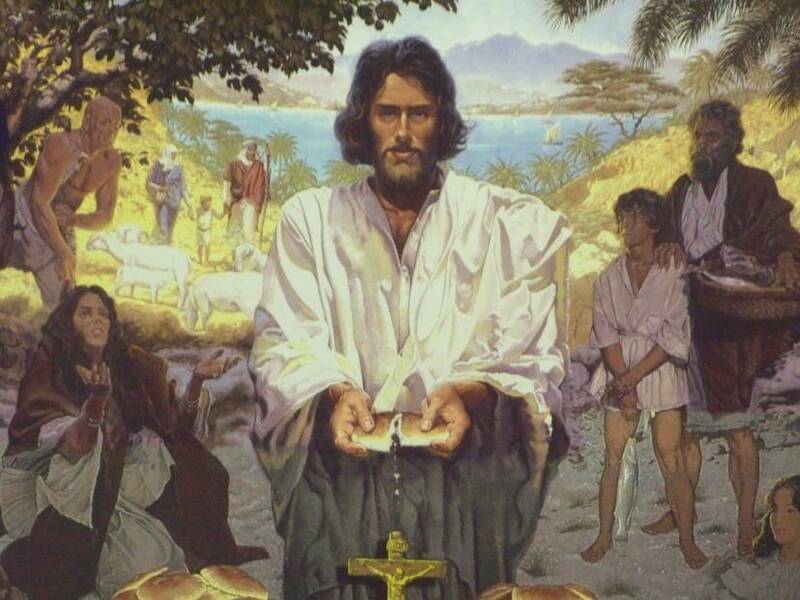 We turn to Christ for our spiritual nourishment. Come to the banquet for the bread of life. The Prayer Walk: Behind the church, at the East end of the parking lot, is the entrance to a beautiful walkway which winds through the mangrove and ends at Sarasota Bay. The wooden walkway was constructed by our Pastor Emeritus, Fr. Pick, along with several dedicated parishioners in 1993. To conform to State regulations, this walkway must be used for religious purposes and thus, the Stations of the Cross were built and situated along the path. These stations are rustic in design with each scene hand painted by a local artist. A wooden statue of St. Frances of Assisi greets those to enter the pathway. The walkway takes us through the natural habitat of our area complete with mangrove trees, pepper trees and other native plants. 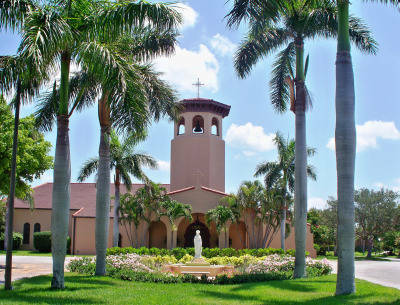 It's a peaceful walk to say the Stations of the Cross or walk on to the dock at Sarasota Bay just to sit and say a prayer and admire the beauty of our locale. We encourage everyone to experience this special area. The Memorial G arden: Adjacent to the Prayer Walk is a Memorial Garden which is the final resting place for many of the dedicated parishioners of St. Mary, Star of the Sea, Parish. A beautiful relief sculpture of the Pieta adorns this peaceful spot.